Sydney, Australia — Video services and expertise from TDC – Technical Direction Company wowed audiences across the world in Visions of Vienna – a multi-media artistic collaboration between the Vienna Tourist Board and the Sydney Symphony Orchestra. 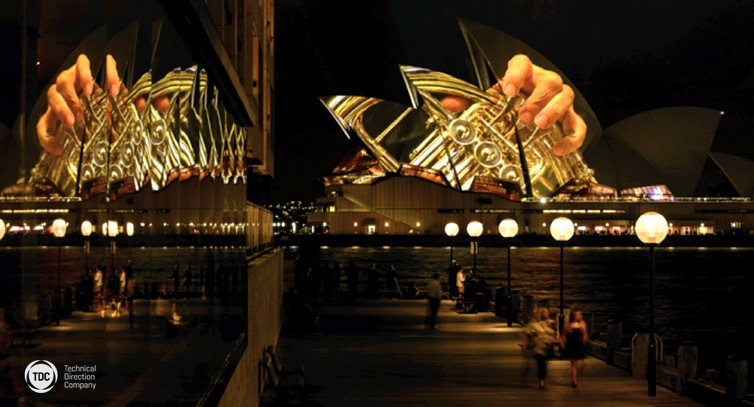 The Sydney Symphony Orchestra live in concert was combined with visuals celebrating the artistic and musical heritage of Vienna from Ample Projects and projected onto the roof or “sails” of the Sydney Opera House and broadcast to music lovers across the world in a live web-stream. The event took place at approximately 8:30pm (AEDT) on Wednesday, 4 February 2015. “Having worked with Michael Hassett and his expert projection design team already back in the 90’s we knew we could turn to TDC again for another unforgettable visual spectacular. TDC are a dream-team to work with,” enthused Astrid Mulholland-Licht, Director of the Austrian National Tourist Office in Sydney. “During design, TDC’s team of creative and technical experts created a content template so that Ample Projects and the Sydney Opera House Recording and Broadcast Studios were all working from the same plan. This also helped to save time on site. We worked closely with the Sydney Opera House production team and other suppliers to overcome any technical issues,” explained Olin Winton, Technical Manager at TDC. Fourteen cameras captured a performance by the Sydney Symphony Orchestra of glorious Viennese music. Viennese inspired 3D animations designed by Ample Projects celebrated the Austrian capital’s rich artistic heritage. 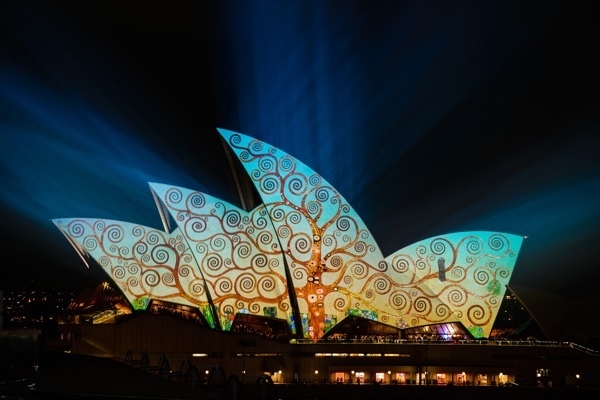 Projection of artistic content posed several technical design challenges including building size, long throw distances, a busy Sydney Harbour port in the projection path, and multiple microwave broadcast links. TDC provided the industry’s brightest, high-resolution projectors supported by powerful high-performance media serving technology. “A finely tuned methodology developed over a number of years has led to locating specific projection locations to project over the ferries and cruise ships that come into port. Isolated projection platforms are designed for long projection throw distances. Additionally multiple signal transmission paths, HD signals as well as communications, embedded audio for broadcasters were located at the Sydney Opera House,” explained Winton. TDC ensures failsafe systems design for all their projects. “Main and backup systems comprised two way microwave link for transmission path. Audio path was retransmitted via microwave and RF to viewing sites with the audio delay added as needed,” added Winton. The Sydney Opera House is an architectural masterpiece and the most internationally recognised symbol of modern Australia. It is one of the world’s busiest performing arts centres and a core part of the national cultural fabric. The free to attend event was organised on behalf of the Vienna Tourist Board. The concert – Greatest Hits from Vienna – was held at 8pm on 4 February 2015 inside Concert Hall. It was conducted by Ola Rudner and feature soprano Elisabeth Flechl as soloist. A public viewing area hosted by the Vienna Tourist Board at Campbells Cove, Western Circular Quay enjoyed uninterrupted views of the sails.